The C408 is built with CRG construction. The glass is bonded together with special crystal clear glue. The only hardware is the 2"x3" flanged boot used on the support posts. 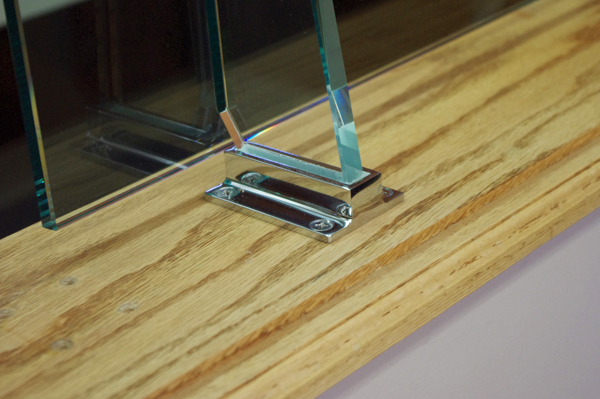 This system is available in twelve different glass types. The standard configuration has a 1/4" clear shield and top shelf. The partitions are available in four standard heights 18", 22", 24" and 26". There are seven standard widths with the largest panel being 60" wide, and decreasing in 6" steps down to 24". We reccomend up grading to 3/8" Crystal Clear glass to get a stricking appearance. Custom sizes are available as special order.